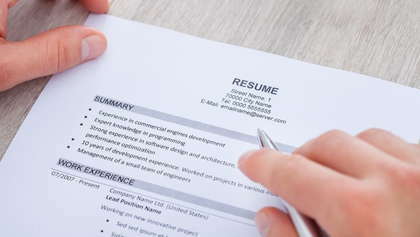 Here are five clues that your resume is unprofessional and how to fix it. Your cover letter is a literary masterpiece. Your interviewing skills? Perfection. You’ve dedicated a lot of time and energy to ensure that your job search goes as smoothly—and as quickly—as possible. But you may have missed the biggest culprit in preventing you from landing the telecommuting job of your dreams—your resume. Here are five clues that your resume is unprofessional—and how to fix it. You’ve written (and rewritten) your resume so many times that you can recite it in your sleep. This is where even the most dedicated job seekers can get sloppy and send it off without proofreading it one last time. If you have the funds, you can always hire a resume writer to help you out, but if you’re like most people, you’ll try to craft your resume on your own instead. So when you think that your resume cannot read any better than it already does, give it to someone else to look over. Whether it’s your husband, a friend, or even a mentor, having another pair of eyes peruse your resume is a smart move. You might be surprised by how many mistakes are found. These small blunders can make all the difference between getting called in for an interview—or not. You have an extensive background in your area of expertise, and you want every potential hiring manager to know it. Thing is, your resume should not be a version of War and Peace. It’s important to know how to edit yourself (both verbally during a job interview and also on paper) so that you can keep your potential boss’ attention without boring him to tears—or worse, tossing your job application into the trash. Go over your job experience and pick only the top ones to highlight. You may think that "[email protected]" is a fabulous and funny email address, but you won’t win over a hiring manager with a silly email account. In fact, it can work quite the opposite and leave the impression that you’re potentially immature and irresponsible. Instead, create a separate email account (Yahoo! or Gmail will do just fine) with your name (or a version of it) so that you come across more polished and job-worthy. Let’s face it: resume writing is not for the faint of heart. It takes time and practice to create a resume that boasts your accomplishments (without boasting, that is), and gives the person reading it a sense of who you are as a potential employee all encapsulated within one page. That’s where some people stumble, though. In an effort to cram as much info as possible into their resume, they forget the single most important thing that a resume should have: you. Wherever you can (and where it makes sense), you should try to infuse some small aspect of your personality to give a hiring manager a sense of who you really are. One great place to do this on your resume is in the Skills section! Imagine, for a moment, that you are the hiring manager reading your resume…along with the other 248 other resumes he received for the same position. After a while of reading resume after resume, your eyes will most likely glaze over. One way to avoid this is to make your resume stand out. You can choose a more unique font, but make sure it’s still legible and professional-looking. And avoid justifying your resume to have uniform borders. After all, a big ol’ block of text can be a bit boring to read. Find ways to make your resume interesting, both in terms of content and visuals, and you’ll be one step ahead of many other job candidates vying for the same telecommuting job!